Ninja Turtles Upcycle for My Birthday! – Everything Your Mama Made & More! Last month, I was browsing the little boys’ clothing racks at Target and came across this awesome Teenage Mutant Ninja Turtles set. 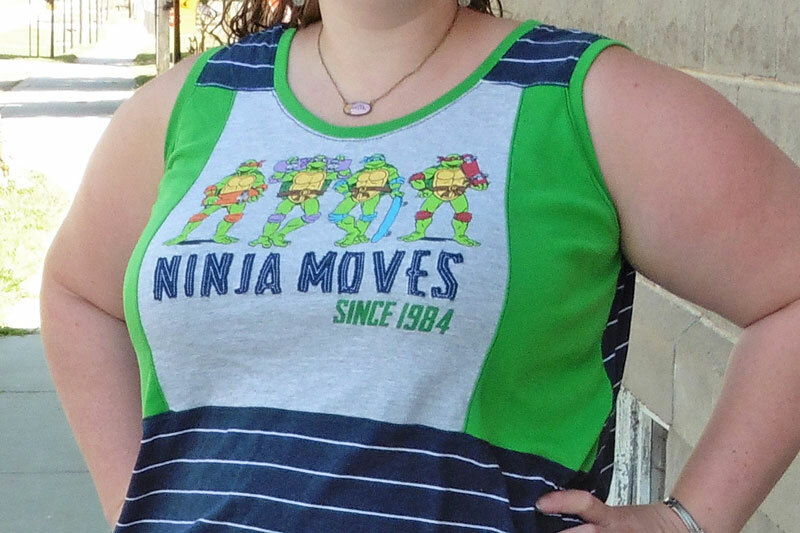 I wanted it in my size since it says “since 1984” and that’s the year I was born. So, what’s a sewist to do? Buy it and upcycle it, of course! I knew it would be a fun sew for my birthday! 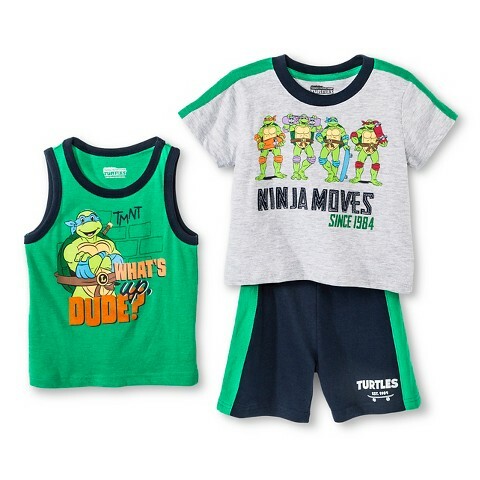 I picked out the size 5T, both to give me the most blank shirt space around the design and because (conveniently) my boys both fit into that size and so could wear the tank top and shorts that came in the set. After pre-washing, I carefully seam-ripped the neckband off and squared up the fabric around the design. I used this t-shirt surgery method to add fabric around my turtle panel, making it wider and long enough to fit on the California Dress & Peplum scoop neck bodice, which I cut at peplum length and left off the elastic waistline. I was thrilled to find some thrifted green knit in my stash and to pair it with a navy and white pin stripe cotton jersey I received in June’s KnitFix. 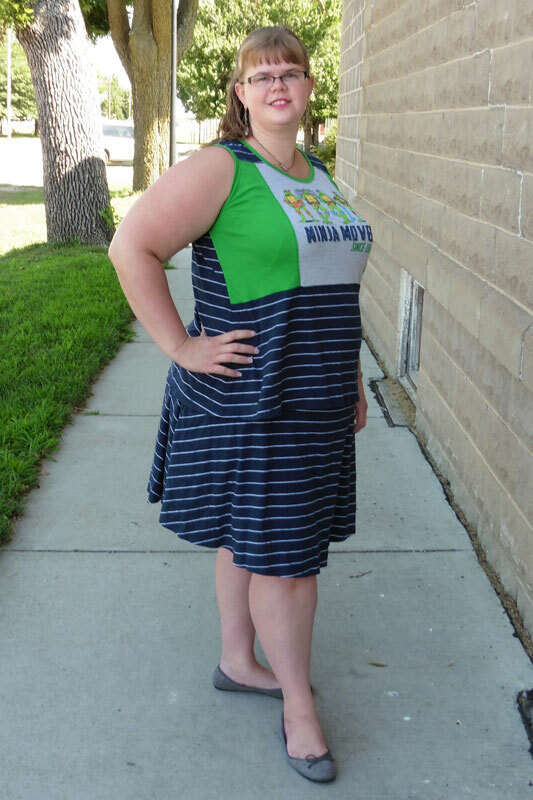 I was originally going to wear my upcycled tank with jean shorts, but then Kymy tested and released the Capsule Skirt while I was vacationing in Florida and I just had to make one. 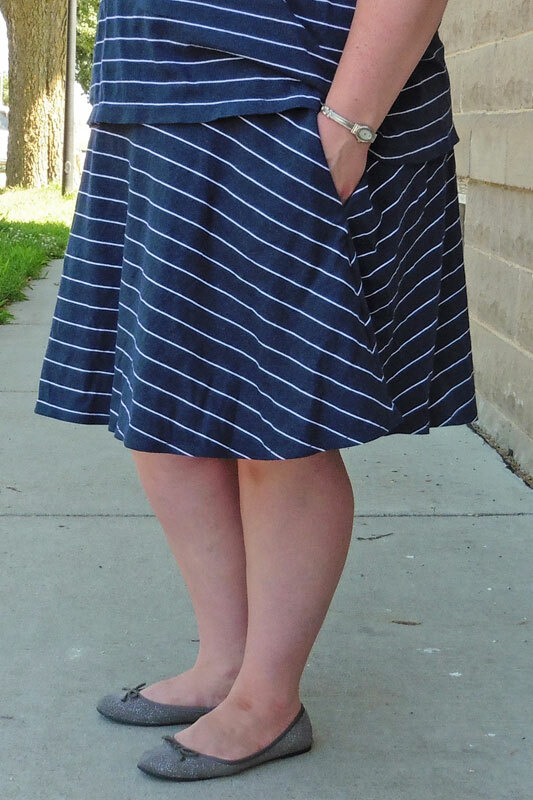 I was excited to find I had just enough of the stripe jersey to squeeze out a skirt to match my top! Just don’t ask to see the pockets, cause the stripes totally don’t match up in there. Haha! I absolutely love the included options for this skirt! The hemline choices allow for a longer back, which means I get a level hem in spite of my large behind. I’ve never had any form of circle skirt before where my bottom hem falls so evenly! I also love the way the pockets are shaped and sewn so they stay in the front of the skirt and won’t fall behind my thighs and get sat on. Hooray! I’ve already got fabric picked out to make another Capsule Skirt! I’m loving how comfortable and yet still totally awesome my “birthday outfit” turned out! Lucky me, my mother-in-law is babysitting tonight so hubby and I can go to dinner and a movie! What a cute outfit. That skirt does have a lovely drape to it. Happy Birthday! I LOVE this! I would never think a 5T would work for a women’s upcycle, but this looks so good. And I never would have thought to put those colors/fabrics together, but they are perfect. 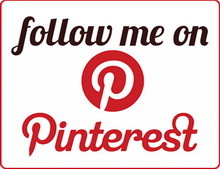 Thank you for sharing and for all the inspiration you provide!